On Monday Ged and I drove to the Cold Fell Road to walk up two more Outlying Fells, Cold Fell and Flat Fell. Two short walks separated by a five minute drive and lunch. There were blue skies north but a big mass of cloud was keeping us in the shade…. Lingmell via Piers Gill with the Pollocks. Ard Crags and Knott Rigg on a blue sky day. Tuesday was due to be very warm, and as we had descended quite an arduous route yesterday, we picked something simple and easy on the knees. Helm Crag (The Lion and The Lamb) from the lay-by outside Grasmere. A short route up and an easy route down…. High Rigg and Tewet Tarn in Snow. Dollywaggon Pike to Raise in Snow on a Beautiful Blue Sky Day! On Thursday Brendan and I drove to Grasmere to climb Helm Crag. There was still snow on the tops. A good little walk of about five and a half miles. The walk took about four hours. We spent the rest of the afternoon in the village. Jo…. This afternoon the weather was too good to stay in. Brendan and I went to Birkrigg via Great Urswick. A good little mooch about on a sunny afternoon. Jo…. On Friday Ged, Kas and I drove to Wasdale to climb Lingmell (2649ft), Scafell Pike (3210ft), Scafell (3162ft) and Slight Side (2499ft). A walk of ten miles. 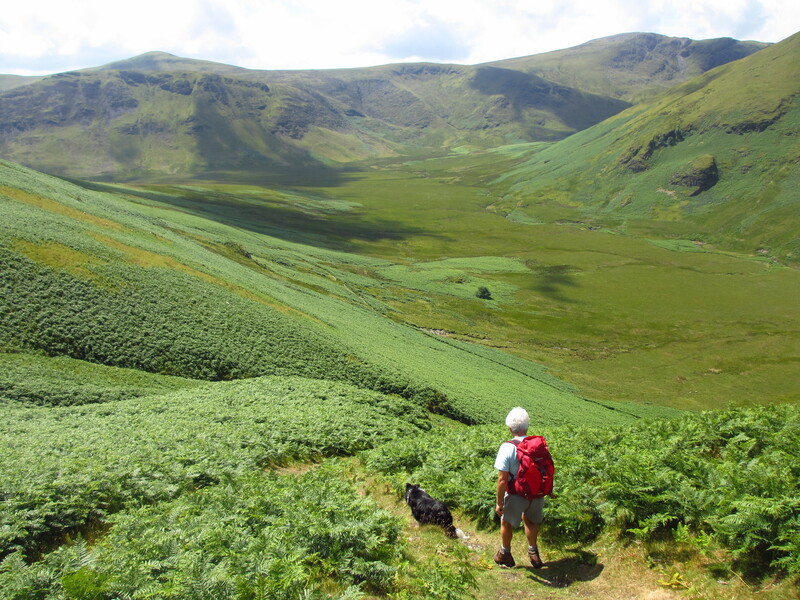 Back in January 2009 I decided to have a go at completing all the Wainwright Fells in a year…. This morning the weather was too good to stay home, so I drove to Hodge Close for a quick walk up Holme Fell (1040ft). A good little walk, only two miles, plus the detours to the quarry and tarn. I was back home for lunch! Jo…. Yesterday the sun was finally shining, but it was still very windy so we went for a walk down towards the north end of the Island. A quick walk of just an hour and a quarter to blow the cobwebs away! Jo…. Yesterday we drove to Troutbeck, parking by the church (bottom right on the yellow road with the 2 arrows). Walking to Ambleside via Skelghyll Wood, doing some shopping and having some lunch, then returning over Wansfell Pike. A walk of over 7 miles…. Greystones, Ling Fell, Sale Fell and Broom Fell. An Old Quarry, Two Reservoirs, Holme Fell, a Tea-room and a Tarn. It was a warm and sunny day today so we drove to Hodge Close, an old quarry where climbing and scuba diving takes place. A good little walk with lots to see, only about 4 miles long and easy walking. Jo…. Robinson, Dale Head and Hindscarth in Rain and Wind. Today we went to Ashness Bridge to climb Walla Crag (1234ft), Bleaberry Fell (1932ft), High Seat (1995ft) and High Tove (1665ft) descend down to Watendlath and follow the trail down the valley back to Ashness Bridge. A walk of just under nine miles…. Today Tom and I took the car to Low Tilberthwaite just north of Coniston to do a circular walk to Little Langdale Tarn, Cathedral Quarry and Hodge Close. About 5 miles, but only 1000ft of ascent. The weather was windy and it rained most of the time…. Decided to go up from Wasdale Head to Illgill Head, on the side of Wast Water, and known as the Wast Water Screes (2000ft). A circular walk along the tops of the screes to Whin Rigg, down to Nether Wasdale and back along the Lake to where we started…. Went to Easedale Tarn today. Tom, Ged, Kas the dog and me set out from Grasmere and walked up Sour Milk Gill. All in all a good day out. Jo…. Went to Catbells on the shore of Derwent Water. (1481ft). Went with Tom, Ged and Kas (6 months old) the dog again. Another good day. Weather was excellent too. Jo….